How do you put a price on seeing a Beatle? Where do you draw the line between a justifiable expense and outlandish waste? Is any one man truly worth a $165 ticket, before service fees? Luckily, I didn't have to pass that judgment on Sir Paul- I got to enjoy the entire concert for free. I'm not bragging. Nor was I alone. A couple thousand of Paul McCartney's biggest fans surrounded Wrigley Field on Monday night to listen to some of the greatest songs ever written. When the idea was first pitched to me I was a bit hesitant. Would I actually be able to hear anything? 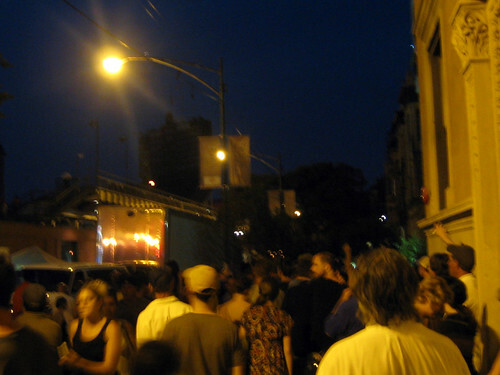 Was it worth being in Wrigleyville for three hours just to hear some faint na-na's from "Hey Jude" while surrounded by pack of drunk fratboys puking along? I got more than I could have hoped for. Paul's sound system was impressive. 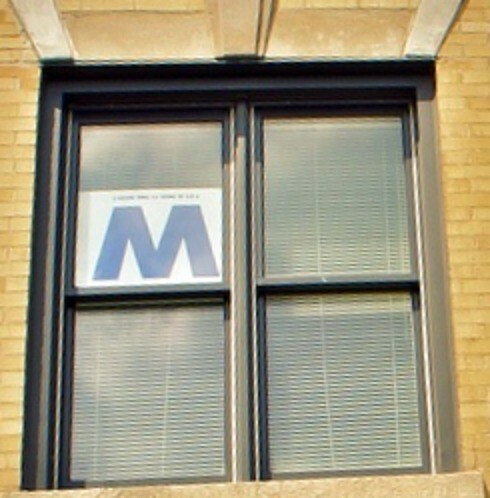 I heard him more clearly while camped out on Waveland Avenue than I heard A Place to Bury Strangers from four people back at this year's Do Division Fest. In short, this was one of the best shows I've ever seen, and I technically didn't even see it. As anticipation built toward the first song, small groups of Beatles fan hung around on the street, passing around joints and bottles of wine, singing "Rocky Raccoon" and "Eight Days A Week." Seemed more than appropriate, though not nearly as entertaining as the twelve year old kid who interrupted them as he bounced down Clark singing Human League's 1982 hit "Don't You Want Me." The nonsense was eventually broken up by thunderous cheering from inside Ye Olde Concrete Dump, followed shortly by the grand opening chords of "Magical Mystery Tour." Despite being a huge Beatles fan, this song was never high on my list of favorites. That said, the hollowness that always bugged me about the original was nowhere to be found on this night. Live, the song channeled the energy of Cheap Trick's cover more than anything else. It was the perfect way to open the show. Paul kept his momentum with the "let's go let's go" of "Junior's Farm" before turning 60 year old women back into screaming teenagers with "All My Loving," The latter number gave me some of the most intense goosebumps I've ever had, and from the looks of the people on the street I was at the low end of physical reaction to the song. For a moment the colors on Waveland seemed to fade while I waited, half expecting to see four suit-clad charmers rushing into a getaway car. The fist-pump inducing chorus of "Jet" pulled me out of my little evening-dream and back into the marathon that this show was already starting to look like. "Got To Get You Into My Life" sounded appropriately grand live, even getting the pooch in the apartment window behind me to perk up. I know Paul's a big fan of elaborate arrangements, but damn does he sound great when doing a stripped down rock song. And while we're on the subject of his sound, I have to admit to being completely blown away by how good his voice still is. The man doesn't sound a day over thirty. Another treat came just after "Sing the Changes," when Paul began a song he's apparently not played live before this tour (if you don't count that famous BBC session in '65). 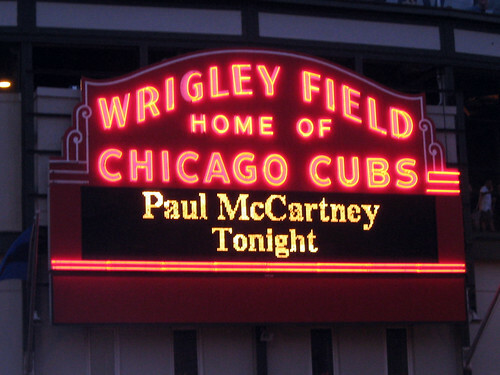 Hard to believe, because "The Night Before" would've blown the roof off of Wrigley had there been one. The part that impressed me the most was how great the harmonies sounded. Always key, especially in early Beatles songs, the tandem vocals could've tricked anyone outside into thinking the rest of the Fab Four were onstage with Paul. Couple dancing to "Maybe I'm Amazed"
Things were slowed down a bit during a bluesy romp through "Let Me Roll It." This wound up being the first point in the show when I was again distracted by the people around me as I watched a jogger try and pace her way through the massive crowd, only to be hit in the knee by a double-wide stroller caught navigating in the opposite direction. Why either thought traversing this bundle of humanity was a good idea, I'll never know. Thankfully I was snapped back into attention by Paul and his boys singing the opening of "Paperback Writer." I was more than stunned at the reception the tune got, probably one of the two biggest cheers of the night. Based on the crowd's enthusiasm you would've though Ringo popped up onstage to join Paul in "A Hard Day's Night." Conversely, I didn't think the opening notes of "Maybe I'm Amazed" got the amount of pop that the song deserves. About a minute into the song, just before the solo when Paul really starts stretching his voice, was the first and only time I actually wished I was inside. It's simply him at his best, a ballad, a love song, but tempered to a palatable and ultimately satisfying four minutes. The next portion of the set was filled with soft acoustic numbers; a sadly empty-sounding rendition of "I'm Looking Through You" that was missing its conviction and jangle, the soothing "And I Love Her," which got another big rise out of the audience, and a whispery stroll through "Blackbird." The most tear-inducing portion of the night capped off this segue into the unplugged, as McCartney played his somber John Lennon tribute, "Here Today." Despite the fact that he was singing more softly than at any other point, he was heard clearly on the streets. Even the casual passerby got the hint that something surreal was taking place and shut up as Paul sang "And if I say I really loved you/ And was glad you came along/ The you were here today/ For you were in my song/ Here today." I got tingles all over again just typing those lyrics. Ever the professional showman, Sir Paul then cheered everyone up with the bouncy, ukulele-infused infused "Dance Tonight." The song is perfect for holding hands and hopping through a field, complete with a stomping bass drum rhythm and whistling melody. Even though we were well into the night, I swear, the sun almost came back up to soak it in. Another tribute to an old friend wasn't far behind, as Paul surprised the crowd by playing the George Harrison-crafted "Something." He began solo, strumming away on the uke. It was interesting to hear, but the cheery vibe the instrument created, along with Paul singing with more joy than lamented tenderness just made the whole thing a bit odd. Midway through the song the rest of the band kicked in, bending on George's guitar solo and giving the song back its trademark weight. "Ob-La-Di, Ob-La-Da" had people in the streets dancing along to its ska riff and properly charged them up for the opening of "Back in the USSR." Definitely punchier live than on record. "I've Got A Feeling" was one of the few moments where you could hear Paul's age slipping through the vocals. While it did succeed in transporting me to a rooftop show that took place fifteen years before I was born, The Cute One wasn't able to reach down and scrape the gravel of his original vocals. It was also a bit jarring to hear him sing the distinctly-Lennon lyrics that follow his verse, a curiosity he treated Chicago to again during "A Day in the Life," which lead directly into an inspired cover/massive sing-a-long of "Give Peace A Chance." The sky was illuminated by the flickering zippos and thousands of smiles as Paul took a step back from the mic and let everyone have their hippie-chant moment. Perhaps needing a moment to catch his breath, McCartney was more than happy to let the crowd do the bulk of the work on "Let It Be" before going all Guns N' Roses-columns-of-flame-and-fireworks on "Live and Let Die." The main set ended with "Hey Jude" and its seemingly half-hour long na-na-nonsense, leaving the crowd in a frenzy until his inevitable return. The first encore was highlighted by "I Saw Her Standing There," which gave everyone the chance to shake their heads and show off their Beatles-woos. The real treat however was Paul's home run second encore, predictably kicked off by "Yesterday." As the hair on my arms was just about to settle back down the crowd began to go wild, presumably as McCartney slung an electric back over his shoulders. The screaming of about fifty thousand people is just about the best introduction to "Helter Skelter" imaginable. That rock n' roll tear ended in a massive crescendo, capped off the the audience shouting, in unison, "I got blisters on my fingers!" Paul concluded the night with a medley from Abbey Road: "Golden Slumbers," "Carry That Weight" and "The End." Just as "Magical Mystery Tour" was the perfect way the begin this marvelous trip, the lyrics "And in the end/ The love you take/ Is equal to the love you make" couldn't have been more fitting. The kind of almost god-like worship that Paul gets is something that normally would make me a bit uneasy, but when I looked around this mass of people Monday night- old hippies, six-year old kids with their parents, yuppies, stoners, trixies, fratboys, bums, policemen, etc. all singing along, smiling and holding back tears, well dammit, he deserves it.